I stopped by my local store and tried on a few new arrivals the other night. Did you catch my update via my Instagram stories on Wednesday night? 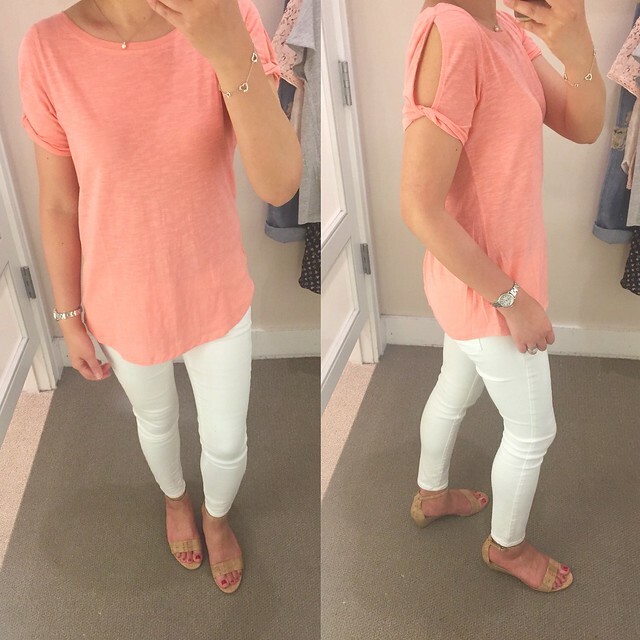 First up is this soft tee recommended by Su @allaboutloft. (I tend mention Su a lot since she’s my online shopping buddy and fit twin since we tend to take the same size. 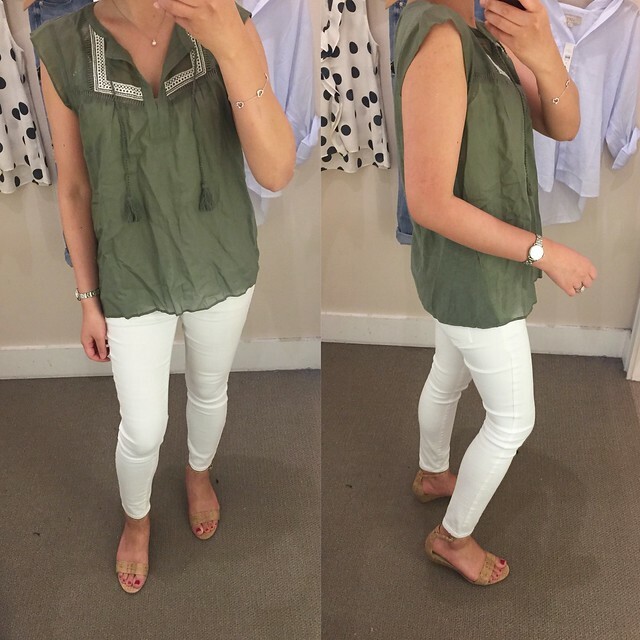 We always chat about sizing, new arrivals and try things on for one another.) I think my local LOFT was just putting these tees out since there was only one in each color at the front of the store. I grabbed size XS to try and it happened to be in the grey color. This tee has relaxed fit that drapes well and it runs true to size. I would have preferred it in size XXS regular for the best fit but I ended up ordering size XS regular the next morning when a clutch I was stalking popped back in stock. The clutch is a dupe of the Alaïa Vienne clutch I spotted at Barneys. Update: I just got this top in the mail. Talk about lightning quick shipping! Anyway, I was lifting my arms and noticed that you can see my sides/bra through the holes from the sleeves. A base layer is recommended to keep your skin concealed. Also, size XXS regular popped back in stock online so I’ll be returning size XS regular since I reordered my preferred size. 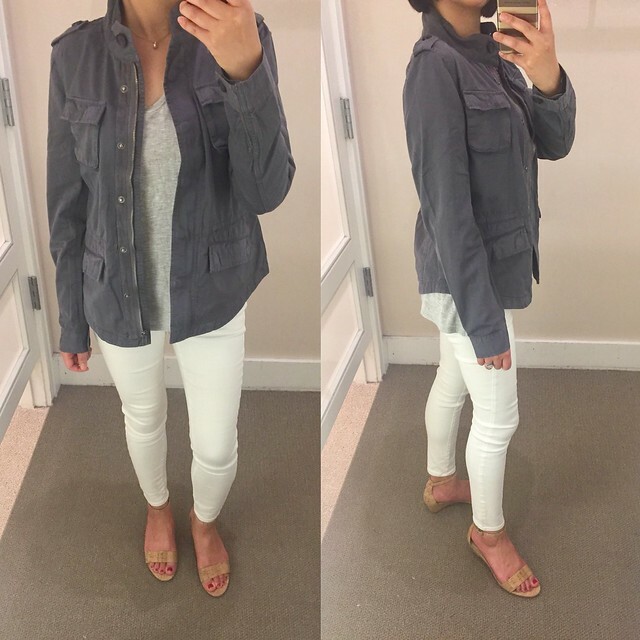 I love this soft utility jacket and I wish it was also offered in an olive color. It’s slightly fitted despite no cinch waist detail to create shape. Size XS regular fit me well through the shoulders and body with room to layer but the sleeves are long on me. Note that I am usually size XS petite. The shirttail hem comes up higher on the sides so your tops will peek through on the sides. I would prefer this jacket in my usual size XXS regular for the best fit. I am holding off on getting this jacket until a 50% off sale but I may cave and buy it if I end up returning a lot of what I ordered to try. I was hoping to have the option of rolling up the sleeves but unless you have tiny wrists the button cuffs simply do not allow it. Su @allaboutloft asked me to try on this vintage tee. It’s not available in petite sizing so I tried on XS regular which fit but the length is slightly longer than I prefer. However, it’s a good length that covers the front and backside which the over-thirty prefer. I’d say this top fits true to size and it’s slightly sheer if you refer to the clip I saved from my try-on. 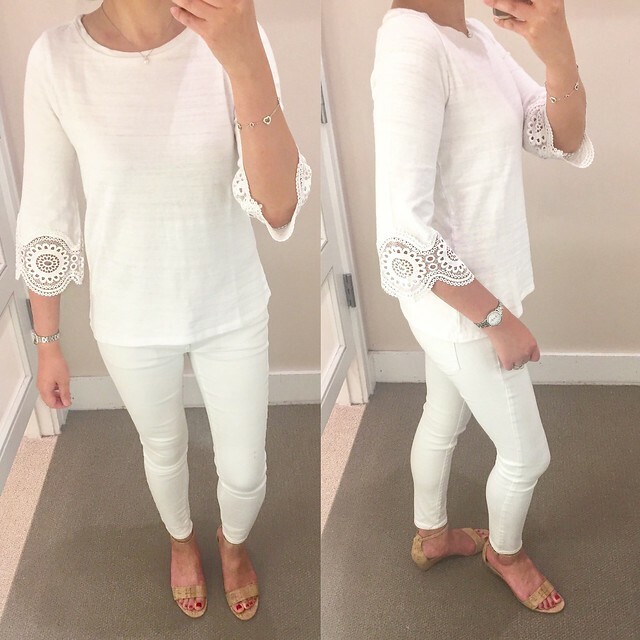 I loved this top as soon as I saw it online but I was worried that this top would fit like the lace bell sleeve top (reviewed here) from the spring. I’m happy to report that this top fits true to size and it’s made of a thicker material so it’s not see through at all. 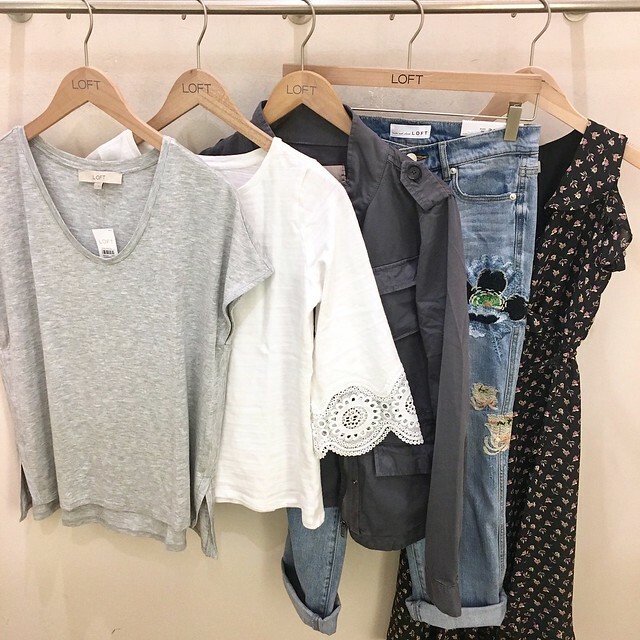 It feels more like a sweater than a t-shirt and it’s a great weight for the fall transition. It has a sweatshirt-like texture to it which some may not care for. I thought about ordering size XXS regular for a slightly longer overall length but I’m happy with the sleeve length in petites so I took size XS petite. 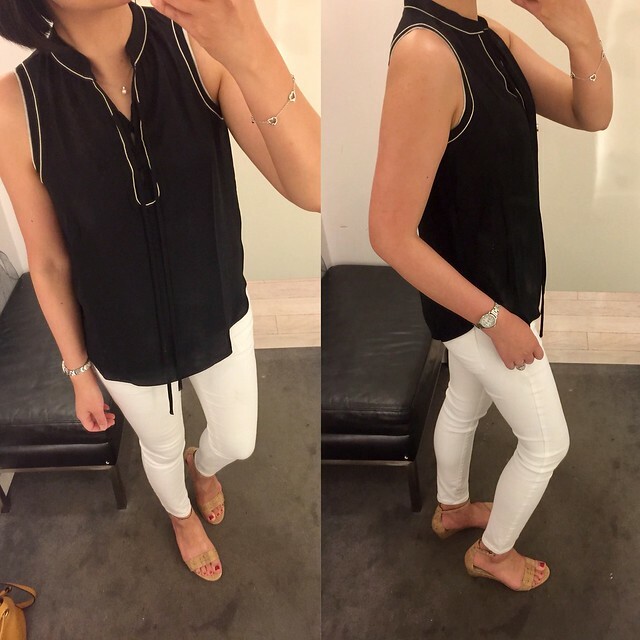 I saw this top on @mrscocowyse and I had to try it on. Up close it has a beautiful floral and dot texture to it as you can see here. It is lightly lined but still every so slightly sheer. It runs about one size bigger since I was able to fit size XXSP when I am usually XS petite or XXS regular for LOFT tops. The flutter sleeves drape well on me and it’s a cute layering top underneath blazers cardigans. 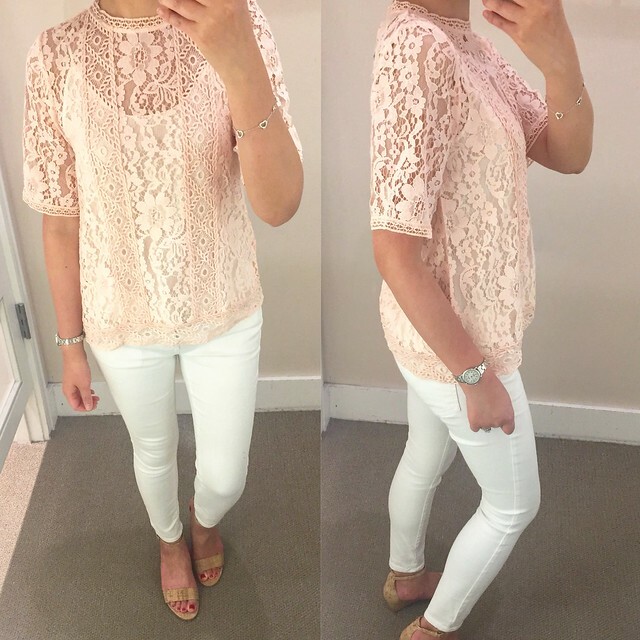 This new arrival reminds me of the striped lace mockneck top from the fall (review here, last seen here). It runs one size bigger since sizing down to XXSP fit me well. In person the pink lace they used is more of a peachy pink which I wasn’t a fan of. It is not lined so a base layer is required. I recently bought two of these silk camisoles on sale (I got them for 70% off as noted this post) and I had them hemmed so I could wear them underneath tops without tucking them in. 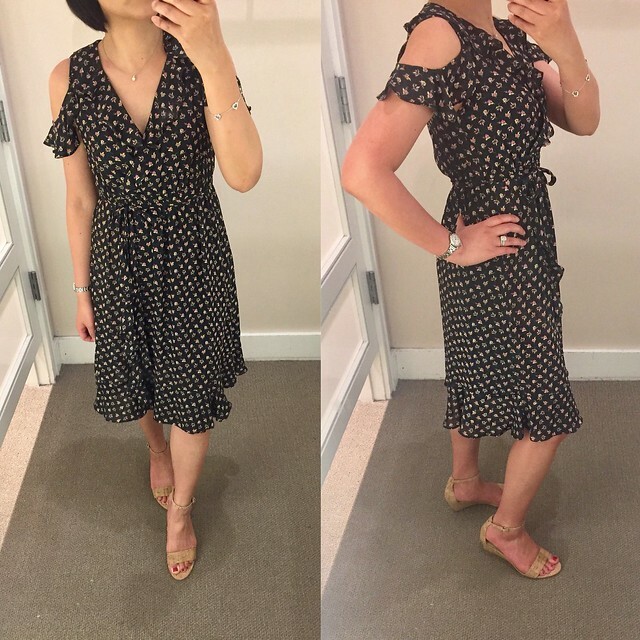 I just had to have this floral print dress the moment I spotted it online. I ordered it on sale last week in conjunction with a coupon code (LOVELOFT2 which expired 8/9) for about 46% off retail ($48.37) and I recently ordered the top to try. I went with size XXSP as recommended by the online True Fit profile and it fits me perfectly. The length hits right below my knees and the neckline isn’t too low. The cold shoulder sleeves are interesting because it’s actually a frilly loop that just drapes on your shoulders but it drapes well. The size of the cold shoulder cutout isn’t too big so it’s very flattering on the shoulders. Some cold shoulder cutouts are so big they make your shoulders seem broader and I hate that. 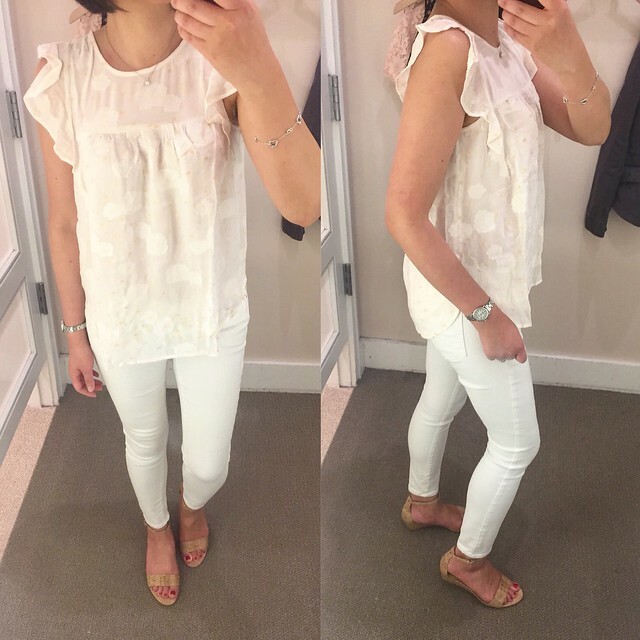 Su @allaboutloft asked me to try on these embroidered jeans for her and they fit true to my usual size for LOFT denim. I am usually size 25/0 petite or size 24/00 regular in their bottoms if it fits true to their usual (vanity) sizing. I cuffed them twice in the above picture but here is what the jeans look like uncuffed. 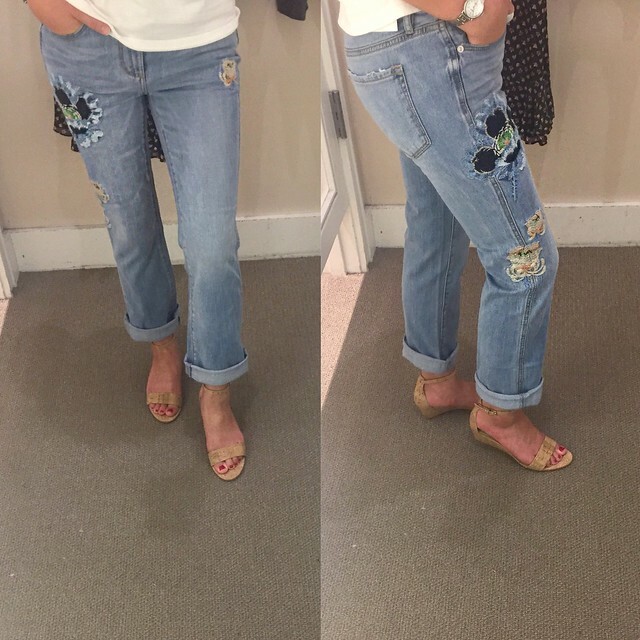 I’m not a fan of wide leg jeans but these were fun to try on and the embroidered detail is very pretty. I ordered the embroidered vintage soft tee instead since these jeans are admittedly too trendy for me. 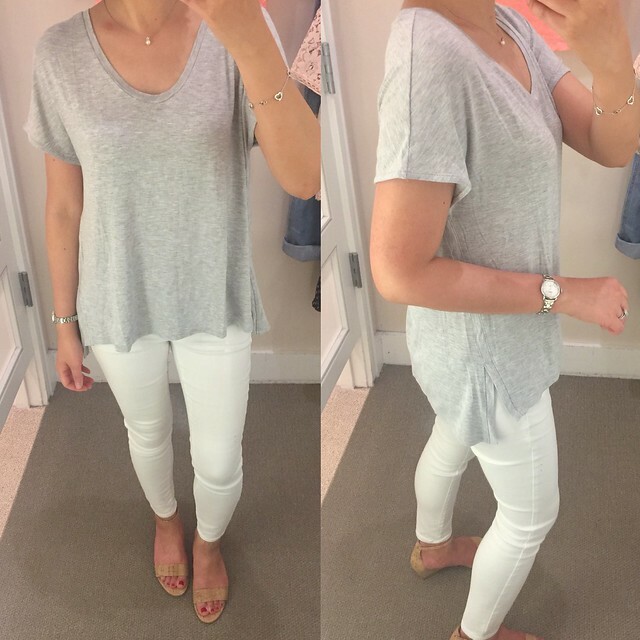 Su @allaboutloft also asked me to try on this dolman shirt for her. 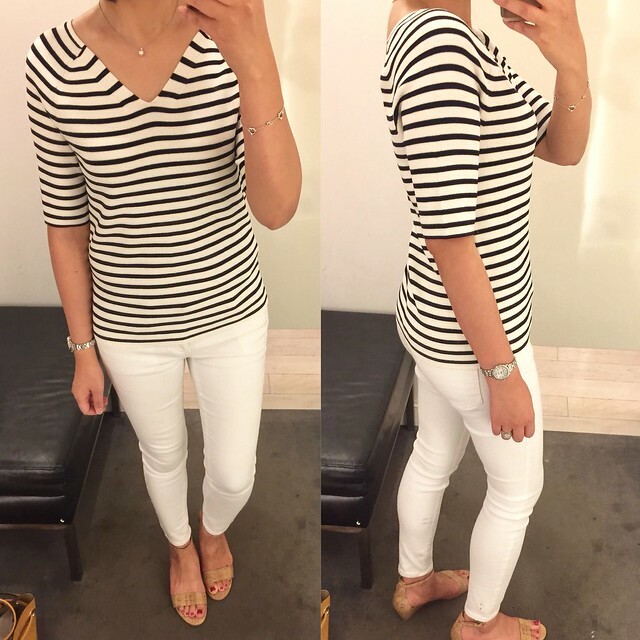 I tried on size XS regular which has a very loose fit as is intended for this style. It’s tissue paper thin so a base layer is required. 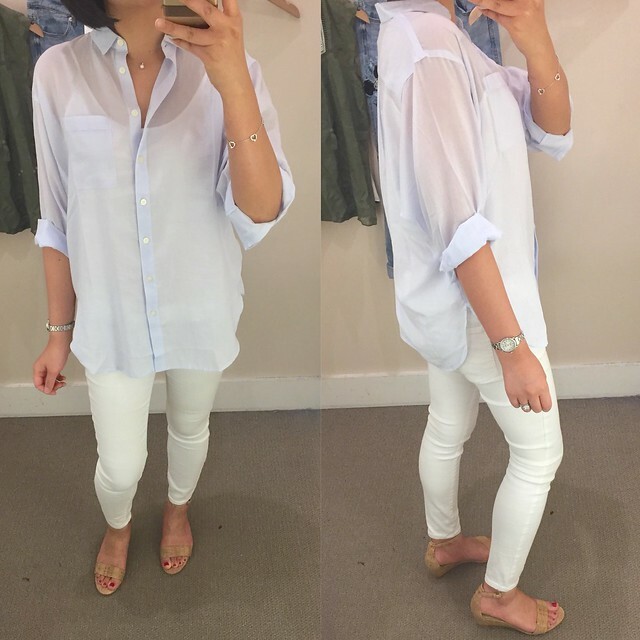 The sale section always gives me anxiety but I found this pretty gauzy top to try on. It’s very thin and see through so I’m wearing it with a cami underneath. Size XSP fit me well so I’d say it runs true to size. 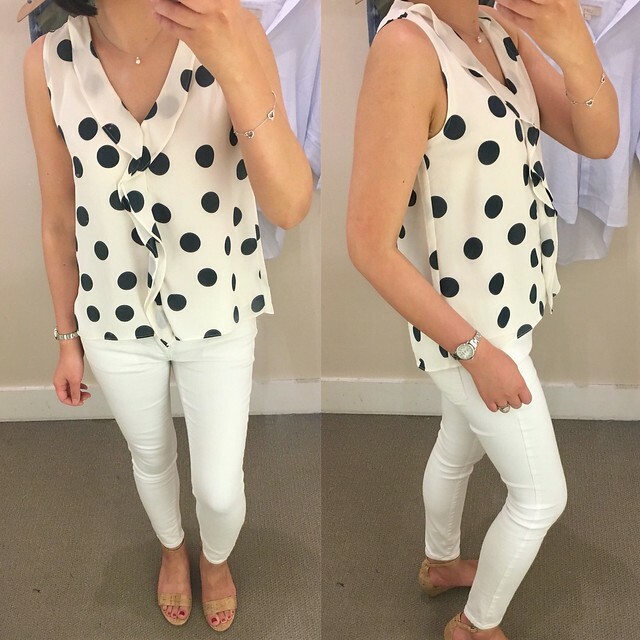 I also came across this polka dot top that I remember from last year since I wanted it but I missed out on it (refer to my old review here and here). Size XXSP fit me but the length was a bit too short for my preference. The tag was missing and the store made a handwritten tag so this was definitely a return of a (way) past season top. One of my coworkers told me she sometimes returns older unworn items and the store will give her the sale price of whatever the item is worth at that time. I haven’t tried returning older items myself for fear of getting carded and banned from in store returns (full explanation here). I usually sell my unworn items on Poshmark or send them to thredUp. I also stopped by Ann Taylor and this striped sweater caught my eye. It looked like it ran short and snug so I tried on size L regular and size M regular. Size L was too loose but size M fit me well. The material is very stretchy but I would recommend sizing up if you don’t like things to be too skin tight.Update 1/19/18: I ended up ordering this sweater a while ago on sale but size M was looser at the shoulders than I remembered based on this try-on so I ended up returning it. I found this sale top in the sale section. The white color looked very sheer so I tried on the black color. I was tempted to get it but I remember it was an extra 60% off sale recently so the extra 40% off was not enticing. It fits one bigger since size XXSP felt like size XSP. I also ordered this cutout pleated full skirt to try since Su @allaboutloft recommended it. Click here to view the clip from my try-on. Size 0 petite fit me well but I need to style it and decide if it’s a keeper. I love skirts but whenever I buy them I find that I don’t wear them enough. I edit/update my blog posts often so I’ll try to share pictures of the skirt later this weekend.